The year is 1734. A large fire destroys a hospital and several houses in Montréal. One of those houses belongs to the owner of an enslaved Black woman. As the fire raged, she was attempting to flee captivity. With very little evidence, that woman was found responsible for setting the blaze. She was tortured and hanged. Her name was Marie Joseph Angélique. This is her story. Factory and Obsidian Theatre present the Toronto Premiere of ANGÉLIQUE, a co-production between Black Theatre Workshop and Tableau D’Hôte Theatre of Lorena Gale’s passionate and persuasive depiction of Angélique’s life leading up to that fire. Through her story, we are given a glimpse into this dark and unsettling part of our Canadian history. The first thing that hit me was Eo Sharp’s imposing set. It is a massive wooden support structure that looms over our characters in thick, unyielding beams. Do they protect or oppress? Both, I think—as they suggested the very social and economic systems that caused the harrowing circumstances we bear witness to here. In the costumes, Sharp continues to evoke meaning by having the period attire peppered with anachronistic flourishes that blur the framing of this as history. By allowing us to see how comfortably—far too comfortably!—the attitudes and patterns of behaviour fit into our recognizably modern world, we’re asked to acknowledge the tenacity of racism. 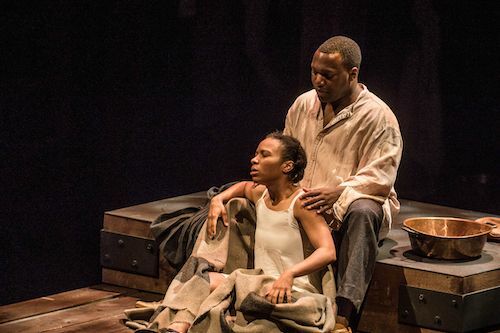 Much of ANGÉLIQUE’s plot calls to mind the stories that abound about the slave experience. From the abuse and sexual exploitation at the hands of her owners, to the conflicts that arise from within the community of her fellow slaves, there is an eerie sense of familiarity with the players in this drama. Where Gale’s play feels unique is in the contemporary framing, the rich insights of her text, and the defiant yet unrelentingly playful spirit that drives Angélique herself and, ultimately, the play as a whole. Mike Payette’s direction is kinetic and stylish without ever sacrificing the core honesty of the play. His production is feels epic in scale, but never obscures those nuances that keep it tangible and truthful. Perhaps one of my favourite aspects of his production is the live score by SIXTRUM Percussion Ensemble. Housed in the upper part of the set, feeling as much a part of the world as the cast, the musicians help to make each moment feel dynamic and convincing. As Angélique, Jenny Brizard grounds the show with her vulnerable, rebellious intensity. I was particularly captivated by the scenes between her and France Rolland as Thérèse. There is a stylized whipping scene that feels particularly brutal and authentic because of Rolland’s unflinching portrayal of a wounded and resentful wife. She’s so terrifying because of how abjectly human she is. I found her husband François, played with an uncomfortable smarminess by Karl Graboshas, less compelling. Graboshas is appropriately skin-crawling as he lewdly forces himself on Angélique in the guise of sympathy and affection. Though neither the script nor his performance delve deep enough into him to expose whatever humanity might ache underneath his appalling flimsy show of manhood. There is some set-up regarding his wife’s cool treatment of him, but it’s not quite enough to make me care. Despite the dismal reality of Angélique’s fate, the exhilarating finale is beautifully anarchic and empowering. With society so seething and divided, we desperately need stories like this that acknowledge the worst in us yet bolster our potential to challenge even our most pernicious demons. ANGÉLIQUE feels painful, vibrant and necessary. Shows run Tuesday through Saturday at 8:00 pm, with Saturday and Sunday matinees at 2:00 pm. Tickets are $40 to $50. Tickets can be purchased through the Box Office, by phone 416.504.9971 or online.